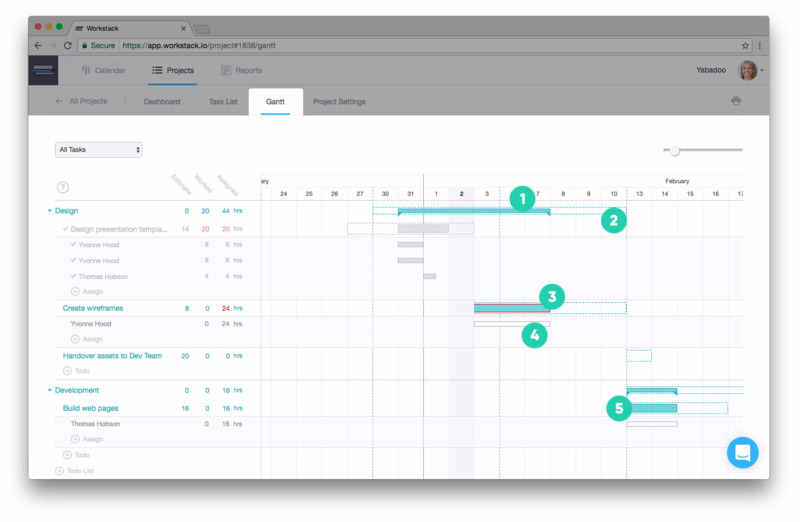 The Gantt Chart view in Workstack visualizes both your project plan and the actual assigned tasks so you can compare them and see when and where your plan has issues. The Plan - the dotted lines that show the timings of your original plan. The Actual Work - the light colored blocks show assigned time and the darker color inside shows the level of completion. The Tasks - these are the smaller white blocks that show the actual segments of each Todo that are assigned to someone. Actual Todo List - The color blocks with pointers represent each Todo List group. It's size is dictated by all the Todos that are inside it. Planned Todos / Todo List - The dotted line empty blocks show the planned start and end dates for each Todo and Todo List that make up your project. Until you start assigning tasks to people your plan will only contain dotted line blocks. Warning - When a dotted line turns red this means that the actual scheduled task inside it starts before or ends after the original plan. Task - In Workstack tasks are the parts of a Todo that are actually assigned to someone. Their combined positions and length dictate the size of their parent Todo. Todo - The color blocks show the scheduled work and the darker color that begins to appear inside represents the percentage of the Todo thats been completed.When the solid border of the Todo turns red this means that the total of assigned Tasks inside the Todo have exceeded the Todos original estimate.